In these epic team-up stories, the Man of Steel finds himself fighting side by side with a strange Batman against a horde of Solomon Grundys. And just what is the sun doing to his powers? Batman, Dr. Occult, Detective Chimp and Klarion the Witch Boy must face a magical Armageddon in the present as Superman is taken to meet the future Justice League at the Hall of Doom! How did things go so wrong-and can anything be done to stop it? 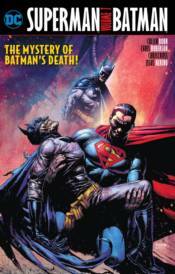 Collects Superman/Batman #76-87 and Superman/Batman Annual #5.